The KSB Miniatures Collection includes several exclusive exhibits that cannot be experienced anywhere else in the world. Many are completely decorated houses filled with period-specific furnishings, art works, functional items, and one-of-a-kind fine art miniatures that are exact replicas of the rare originals. Exhibits change four times a year to coincide with the seasons and holidays. The exhibits below are a sampling of major pieces in the KSB Miniatures Collection. 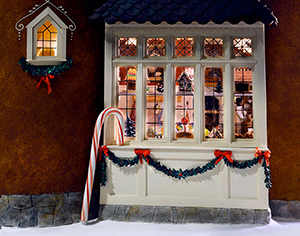 The exterior of the Gingerbread Kitchen. Become filled with wonder this holiday season as you take a trip through Christmases past at the KSB Miniatures Collection. Strolling through the gallery is nostalgically reminiscent of those elaborately decorated Christmas window displays we gazed into as children with tiny toy soldiers, magical reindeer, Old World Santas and other enchanting holiday vignettes. See elves preparing bite-size gingerbread houses, fully lit Christmas trees that fit in the palm of your hand, and the smallest working toys you have ever seen. History buffs will be delighted at the historically accurate re-creations of 18th century Christmases—from celebrations inside an elegant English mansion to a holiday meal inside a famous Russian castle. All the structures are intricately adorned offering seasonal surprises at every turn. 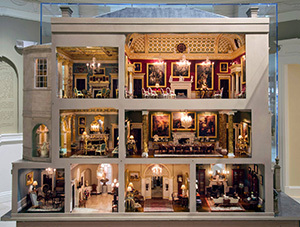 Spencer House by Mulvany & Rogers is the 1/12-scale re-creation of the ancestral home of Lady Diana, Princess of Wales. Earl John Spencer had the original aristocratic townhome built in London in the mid-1700s for his wife, Georgina, as a tribute to their love and happy marriage. It was conceived as a showcase of classical design with the first floor reflecting Roman style, the middle floor Greek influence, and the top level Italian style. Spencer House in miniature features eight of the nine state rooms that are open to the public in England. All of the ceilings were hand carved and painted using 180 sheets of gold gilt. The carpets were hand made on real looms and were produced with 1300 knots per square inch. The desk in the Ante Room is an exact replica in 1/12 scale, as are many of the art objects in gold, silver, and porcelain, including the miniature oil paintings. Click here to see a video on Spencer House. Kaye’s blog on Spencer House here. 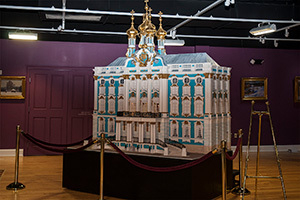 Catherine Palace, inspired by the legendary summer residence of the Russian czars, was a 1/12-scale structure many had heard about, but few had seen prior to its donation to the KSB Miniatures Collection in 2015. It is now viewed by hundreds of visitors who travel worldwide to get a glimpse into how Russian royalty lived—and how English miniaturist Robert Dawson brought the storied 18th century palace to life. Dawson, who traveled to St. Petersburg to examine the original structure, chose six rooms to replicate, including the famous Amber Room, once considered “the eighth wonder of the world” before it disappeared during World War II. Another legendary room, Catherine the Great’s Snuffbox, was re-created thanks to old photographs and a painting Dawson was able to study during his research. Catherine Palace is a temporary exhibit due to its size. Please check the website before visiting to see if it is on display. Kaye’s blog on Catherine Palace here. “What the Roxy is to New York, the Russell will be to Maysville.” That is what Colonel J.B. Russell said when he built Maysville’s iconic theater in 1929. It was built in Spanish architectural style with the interior featuring balconies, busts, and ornamental features to create a mood of make-believe and escape. 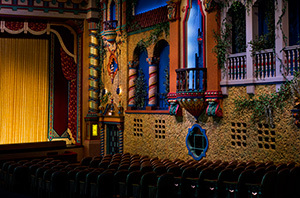 Its design classified it as an atmospheric theater, and today it is one of only a few remaining in the United States. The Russell Theatre made national headlines in 1953 when Maysville’s own Rosemary Clooney chose the Russell to premiere her first movie, The Stars Are Singing. Clooney chose to sit with her best friend from childhood who was African-American, even though the theater was segregated. The theatre in miniature was created by Ashby & Jedd to appear as it did during that time. The exterior of the miniature Russell Theatre, composed of 11,000 hand cut bricks, was completed in 2009. Its interior debuted in 2014. It is one of three 1/12-scale re-creations of historic buildings in Maysville. Kaye’s blog on Maysville’s historic structures here. The Fleece Inn, built during the 15th century in Bretforton, England, is considered an architectural treasure in the United Kingdom. The half-timbered building, which has remained mostly undisturbed since the mid-1600s, represents six centuries of Cotswold history. The last private owner, Lola Taplin, a direct descendent of the man who built the inn, bequeathed the building to The National Trust after her death in 1977, making it the first pub in the country to be owned by the charity. The miniature by the late Pam Throop depicts a cast of characters—Lola talking with pub patrons, the inn’s cook, and Kaye’s husband, Lou, bringing pheasants in from a day of hunting. Even the family dog, Gentry, is featured. The Fleece Inn holds special memories for the Brownings as they spent their 27th wedding anniversary there. 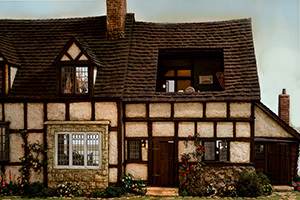 The re-creation of the room in which they stayed is seen through the roof of the miniature. Kaye’s blog on The Fleece Inn here. 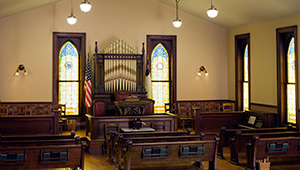 The Bethel Baptist Church in Maysville, Kentucky, was organized in 1844 by a slave, Rev. Elisha Green. In 1848, he was able to buy his freedom and that of his family when a group of white men from the Baptist Church in Mason County loaned him $850 to do so. He served as pastor for the church more than fifty years. The 1/12-scale miniature of the Bethel Baptist Church by Ashby & Jedd depicts the church as it was on West 4th Street before it burned to the ground in 1977. Bricks from the original building were hand cut and mortared to create the miniature which offers a glimpse into a historic building in Maysville’s past. The Bethel Baptist Church was later rebuilt at its current location on Forest Avenue. Kaye’s blog on the Bethel Baptist Church here.